PinkMoon Evenementen & Design proudly presents a new item in the line of self-illustrated stationery! 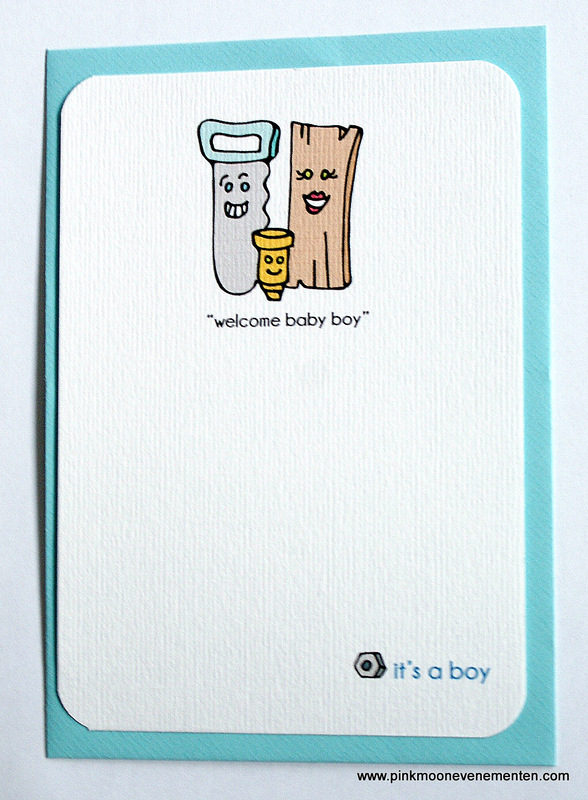 “Welcome baby boy” is a sweet and funny card to send to new parents to congratulate them on the arrival of a baby boy. All illustrations are hand drawn by Mara in her characteristic whimsical style, scanned, digitally colored and printed on heavy cardstock. Buy Welcome baby boy card HERE. Card is shipped from the Netherlands via PostNL to the whole world. If you need this to be sent by express shipping, let us know to adjust the shipping charges. Posted on March 1, 2013 by maraoudenesPosted in stationeryTagged baby boy, funny card, illustration, saw, screw, tools, welcome baby, whimsical style, wood.